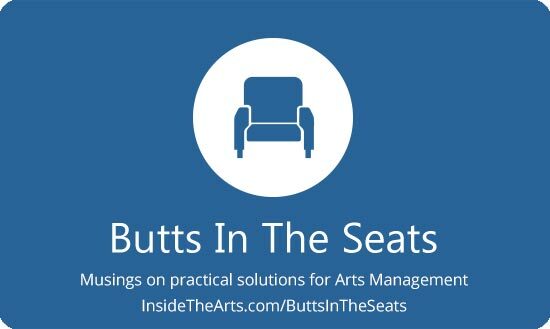 Last week Arts Midwest held a webinar to provide some examples of the way in which different arts organizations were putting the Creating Connection messaging and research into practice. They had representatives of the Eugene Symphony and two arts organizations from Klamath Falls, OR present talk about some of the successes they have seen. Each of the organization links above will take you to pages with examples of brochures, videos, social media campaigns, letters and other pieces each of the organizations used. There were a couple programs that stuck out for me as I was watching last week. One of the biggest “duh” moments for me was the Eugene Symphony’s use of a white board in the lobby to collect feedback from audiences. All those times we have tried to figure out how to get better response rate on surveys, something like this never occurred to us. So many grant applications ask for summaries of the feedback you have collected from the audience. It can’t hurt to have pictures of people enthusiastically participating in writing on white boards. The people from the Eugene Symphony also spoke about how they shifted the focus of their fundraising efforts. At their gala auction, they placed fewer items up for auction and spent more time on storytelling about creating connections. In their donor appeal letter, they changed the message away from “support our excellence.” Instead, when deciding what to include in the solicitation letter, they ask themselves, “Is this going to be the story of their growth, their voice, their well-being or their happiness?” The repeated “their” being the letter recipient. The images in their publications are focused on the experience the audience will have rather than on the organization. The “Meet The Conductor” video only shows Music Director & Conductor Francesco Lecce-Chong in the concert hall or in the process of conducting for a few seconds. Most of the video is him hugging people at picnics and while walking down the street, chatting at ballparks and sidewalk cafes. One of the things I liked was that they used the image of a stick figure hugging the silhouette of the theater for all of their giving programs – donations, volunteer solicitations or asking people to join their guild. Depicting volunteers as loving the organization in the same way as large donors do has a certain appeal. Crystal also spoke about how the Linkville Playhouse’s Little Linkville program, a group of adults who do shows for kids, started having kids usher the shows and design posters as a way of improving the connection with their core constituency. She also talked about how their costume and prop philosophy was that they could only use and wear things that could be found around the house so that if the kids wanted to go home and replicate what they saw on stage, there would be few barriers to doing just that.